The fourth Harry Potter book may be made into two films, its producer revealed at the launch of the latest Potter DVD on Tuesday. David Heyman said pre-production on The Goblet Of Fire was proving so lengthy it might be too much for a single movie. Heyman was speaking as the young cast of the second Potter film, The Chamber of Secrets, turned out for a spectacular party to mark its release on DVD. He said: "We started work on the script last Monday. We're going to shoot it as one and see how it ends up. If it's too long then we'll make it into two." Harry Potter actor Daniel Radcliffe and his co-stars Rupert Grint (Ron Weasley) and Emma Watson (Hermione Grainger) arrived in style at the DVD launch. 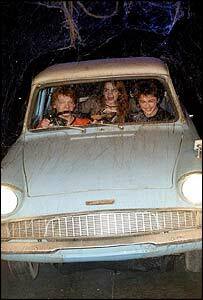 They made a grand entrance in the blue Ford Anglia which features in The Chamber of Secrets. The launch took place at Leavesden Studios, Hertfordshire, where filming has already begun on the third film, The Prisoner of Azakaban. The Forbidden Forest and Hogwarts school were specially recreated for the event. 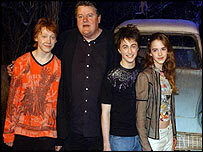 Other stars of the film who attended included Robbie Coltrane, who played Hagrid, and Tom Felton - Harry's rival Draco Malfoy. Among the celebrity guests were Dame Judi Dench with her daughter Finty Williams, and TV presenter Ulrika Jonsson with her eight-year-old son Cameron. 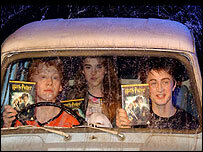 The Chamber of Secrets DVD looks set to become one of the biggest sellers of all time when it is released on Friday. Online retailer Amazon says it has already taken a record 40,000 advance orders. It contains never seen before scenes, interactive tours of Hogwarts and a special look inside the Chamber of Secrets itself. The film took £53m at the UK box office when it was released shortly before Christmas last year. Cast members and director Chris Columbus said they could not wait to read JK Rowling's fifth Potter story, The Order of the Phoenix, which is released in June.